Our newest project was begun in early March and is the most complex project we've taken on in the last several years. We will be removing the last ten feet of our layout and replacing it with new construction extending out an additional twenty feet. The new area will contain a helix to connect our lower level track work to our upper level. Though we have always had a connection it was mostly on hidden track work and our members rarely used it. Mostly because they lost sight of their consist for the fifteen minutes or so that it took to traverse from the lower to the upper level. The new helix will be exposed, significantly shorter, and hopefully will be more utilized. The removal of this area will not begin until our June Open House is complete. In the meantime Robby will be continuing to work on his plans and refine them to his satisfaction. Enjoy the photos below and follow the work as it was being done. Here a photo of Robby on the left, and Jack Shelly on the right discussing plans for the addition. The area outlined with the masking tape on the floor will be where the new track work will extend to. This is a mock up of what will be the construction technique to be used on the helix. 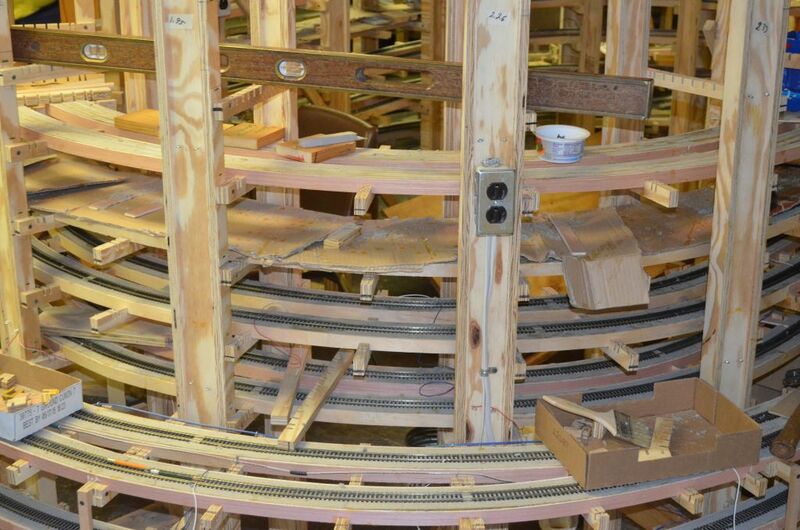 Since the lower level consists of two separate main lines the helix will be two track side by side mains. One to carry the consist from lower to upper and the other from upper to the lower level. This is the first day of our project. We are in the middle of removing this entire corner of our pike. Lots of work went into building this and it seems a shame to tear into it and throw it in the trash. One of the bridges from this section is being salvaged for use in another spot. 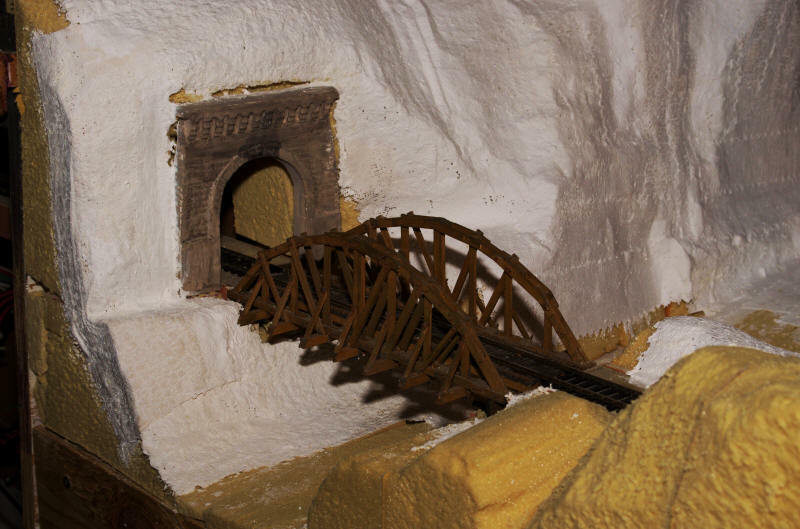 We have three of these type bridges on this corner and we are going to be sure and save each of them..
A heap of trash from what used to be a beautiful section of our layout. Demolition is just about complete. The 110 volt wiring has to be removed in addition to some of the DC wiring. Next we will do a little sweeping, some clean up, and then start laying out the new construction. Here's a photo of some of our crew hard at work. I believe someone needs to have a talk with the foreman in charge. After the old bench work was cut away we cut an access hole which leads to the basement. This will end up being in the middle of our helix and allow us to get to any problems that might occur during the transit of a train on the helix. Now the prep work is finished and Robby is starting the supports for the risers. Obviously some of the members of the club believe he requires some supervision. April 03, 2013 - The risers are now being installed. Thank goodness we have enough supervisors for this project. 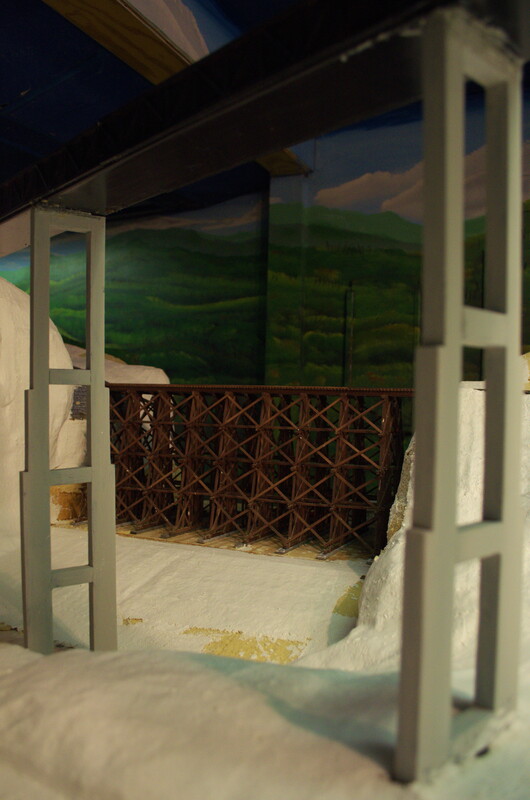 April 8, 2013 - This is an example of the construction method we will use for the sub roadbed. It takes a lot of planning but its fast, there is little or no waste of material, and super strong. Plus it is really easy to lay track on and holds spikes well. A test fit using a plastic spline to see how the roadbed is going to take to the curve. With this method of construction a smooth curve is automatically formed. May 5, 2013 - The first of the track is being laid by Tony Matukonis. If you look close you can see the tie in of the lower track to the existing layout. The trackwork Tony is installing will be but a simple loop track for our lower level. The helix roadbed has not yet been installed. We are using code 100 flex for the hidden track and blackened code 83 for the upper level. Also we are installing an electrical tie in for each track 3' section. July 03, 2013 - We've installed electrical outlets around the entire helix. This makes it a lot easier for us to use our power tools, solder guns, etc. July 10,2013 - John Wiegand wrapping it up for the night. We now have about half the helix complete, two more layer to go. A lot of the top portion of the framework will be removed after we determine the final height. 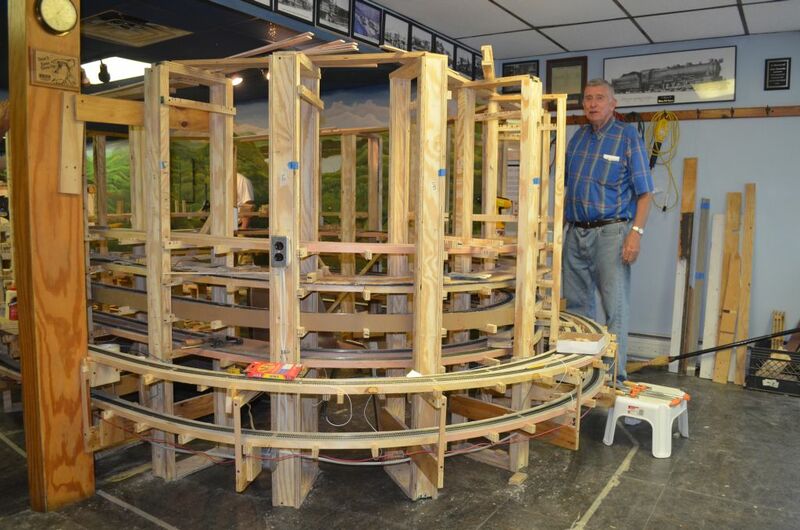 August 15, 2013 - The helix is just about complete but we still have the run around track to install. Electrical tie ins are complete for the most part but again some detail to finish. Sept 05, 2013 - Just abut all the main trackwork is installed. The helix is complete along with the main line run around track. Now we need to install the track at the top of the helix to serve the industries and the necessary scenery and structures to go with it. This last bit has not yet been decided upon as we have not yet come up with a agreed upon landscape for this area. Keep tuned on this one !! 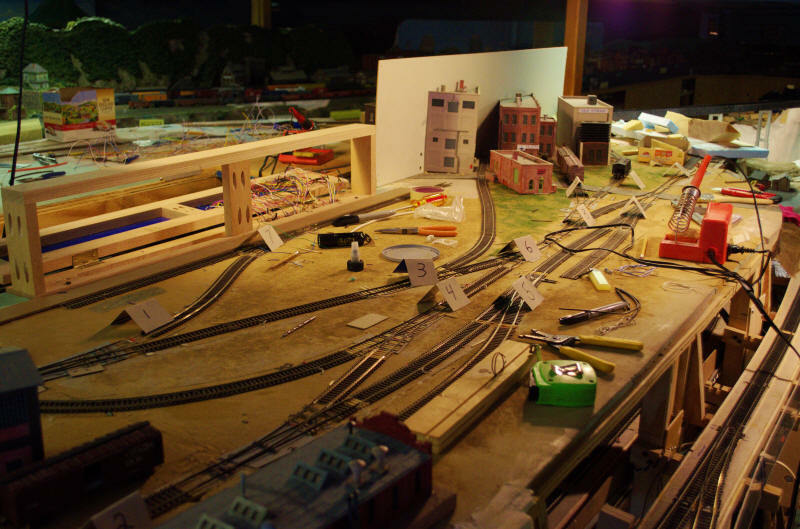 July, 2014 - Yard trackage is nearing completion. Scenery, buildings and other items are not yet decided upon and will be installed as we acquire them. August, 2014 - A small bridge over a creek is being checked for fit and will be permanently installed as soon as the water in poured. Sep, 2014 - Other bridges have been placed and will await the completion of the yet to be poured river.